A few months ago I was able to get a Mascot for a good price. The Mascot is a propelling pencil made from sterling silver. A few years ago Dave showed it on his blog. Mine is stamped with the date letter G, so it must be from 1956 or 19571, a time when the maker, Edward Baker, was already part of Yard-O-Led (In 1952 Frank Tuffnell became the majority shareholder of Yard-O-Led and acquired Edward Baker2. In 1955 Yard-O-Led took over Edward Baker3 ). Despite having been part of Yard-O-Led the pen doesn’t seen to have been marketed as a Yard-O-Led pencil. This could be down to the fact that the internal mechanism works in a different way. According to The Writing Desk all Yard-O-Led pencils ever made accept 3″ leads4, but I can’t see how these could fit into the Mascot – so maybe the different mechanisms in Yard-O-Led and Edward Baker pencils and the resulting difference in leads used was part of the reason why the pen was not officially sold as a Yar-O-Led. My pencil came in a Yard-O-Led box and with Yard-O-Led instructions, but as the pen is 60 years old these might not be the original box and instructions that came with the pen. Including leads the Mascot weighs about 28g and has a diameter of just over 8mm – round pencils tend to have a diameter of about 7.5mm and hexagonal ones have about 7mm between opposing sides. The pen a bit more than 12cm long. Despite it being thicker and certainly heavier than a wood cased pencil it does feel small in your hands …modern pens are usually bigger, but the heavy weight of the Mascot, for its size, makes it feel solid and expensive. The leads have a diameter of 1.18mm5 and are nearly an inch long. 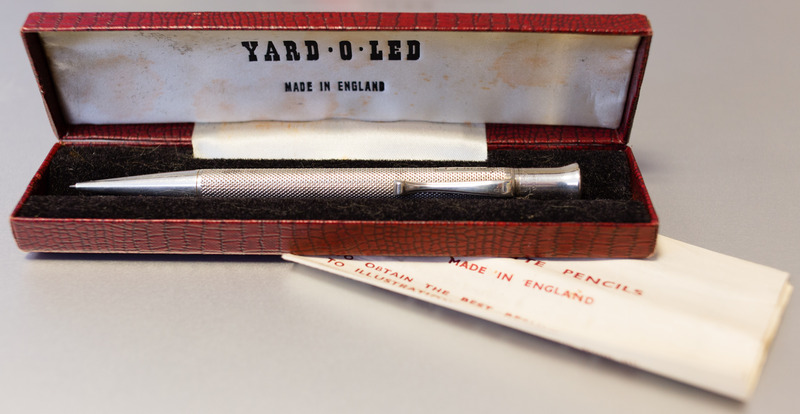 Yard-O-Led’s name came from the fact that their pencils could hold a whole yard of lead in refills. If you are of the metric persuasion: 1 yard has 36 inches, so you would need 36 of these inch long refills for a yard. My Mascot came with 6 leads, but it could probably hold around 12 leads. 12 inches are one foot, so I guess Foot-O-Led would be more suitable as a name for the Mascot than Yard-O-Led. I assume slightly longer 1.18mm leads from Kaweco or Wörther would fit, I have’t tried it out yet, though. These slightly longer leads are 30mm long. 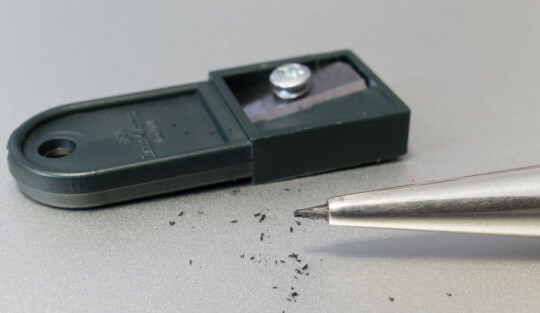 I like a fine point, so I sharpen the leads with Faber-Castell’s lead pointer sharpener box (what a name) 18 41 00. These sharpeners usually cost around €0.60. They are for leads with a diameter of 2mm, but work with 1.18mm. It’s a great looking pencils, even though it is a bit small for today’s standard. I love the wider top/end of this pencil. It is similar to other pens from the past. These days similar tops can be found on Graf von Faber-Castell pens or the Castell 9000 Perfect Pencil (you can see them in this blog post). You can find more Yard-O-Led related goodness at United Inkdom, Scribble’s Too Many Pencils and Dot Cross Dot. I’m very pleased to have found this informative site. It has helped me a lot, as i know nothing about propelling pencils, except they operate in very idiosyncratic ways and can be very beautiful. Would you please answer these questions? We bought an E. Baker & Son *The Mascot* silver propelling pencil as a gift for a teacher. We have to give it to him this Tuesday! It has no lead that i can see. It has the same markings as the pen shown above , although the letter may be a *C* not a “G”. The seller stated it was made in the 1920’s. The body is smooth silver with no pattern. There is a similar compartment on top, like the pen in the photos. The front end turns both clockwise and counterclockwise, but is a little stiff. 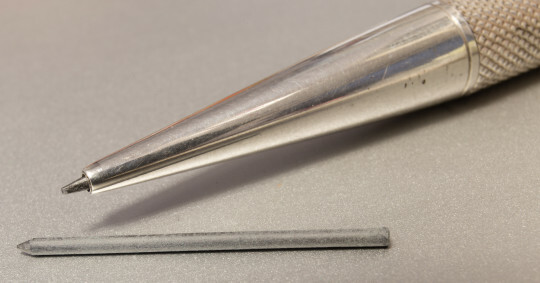 No lead can be seen in the tip. * Do you think our Mascot would also take 1.18 mm lead? * Is there a way to measure for lead size ? * Would the lead be loaded through the tip? I saw some diagrams for this method with modern pencils, but I don’t know if it would be the same. i don’t want to break the pencil or jam it. Thank you for any information and help you can provide. i appreciate it very much. Thank you very much for your comment. I’m happy you like my blog. To check what year the pen is from you can follow the link in the blog post’s first footnote. You might need a loupe to identify the exact shape of the letter. I assume your own will take 1.18mm leads loaded though the tip. You should be able to check the size of the pen’s opening with a caliper. What a nice gift for a teacher. I am sorry for the lateness of this long overdue thanks for your kind reply. The information you posted has been very helpful. We did not have time to measure the tip, but we have not heard as yet if the lead (1.18 mm ) fits. I think it was appreciated, and good teachers should always be honoured. Thank you again, and I look forward to reading your blog. PS Here are two photos of “The Mascot” for you to see. I’m sorry that I have just seen your posting about the Edward Baker ‘The Mascot’ pencil that you have given to your teacher. If it’s any help now, I can confirm what Matthias has told you: the pencil will use a 1.18 mm lead, and it eill be fed through the tip. The date of the pencil can be checked by searching for Birmingham Assay Office Date Letters: if the letter is ‘C’ it will be 1927 and if it is ‘G’ it will be 1931. It is important to know that, at that date, ‘The Mascot’ pencils were ‘propel only’, that is to say that the lead was pushed forward by turning the body of the pencil while holding the nozzle, but to retract the lead you had to turn the body the opposite way and push the lead back with your finger. Much later, the pencil also retracted the lead. To load the pencil, the nozzle should be held and the body turned clockwise as far as it will go, without forcing it. The body should then be turned back anticlockwise and the lead inserted until it is a suitable length to use. The correct length of a new lead is about 30 mm. ‘The Mascot’ pencils were very good, and were sold right up to 1960, by which time Edward Baker and Son had been taken over by the Yard-O-Led Company. Your photographs are very good, and it looks as though the pencil is in excellent condition for an instrument that is nearly a hundred years’ old, and will continue to give good service for many more years. Maria, thank you very much for getting back to me and for showing the photos. George, thank you very much for adding these fascinating details. All of the information you have kindly posted has been very helpful. Bleistift is truly a welcoming community, especially to a complete amateur. I will pass your expertise to the pencil’s new owner. The information you both provided has made everything clear. You are right, pencils like this one will last another 100 years. It will continue to be useful, beautiful, and environmental – all qualities that make it a perfect tool. And experts like you both will keep the knowledge and enthusiasm alive. For that, we can all be grateful. Maria, thank you for your kind words about everyone here. I hope the new owner of the pencil will get many decades of reliable and excellent service from The Mascot.